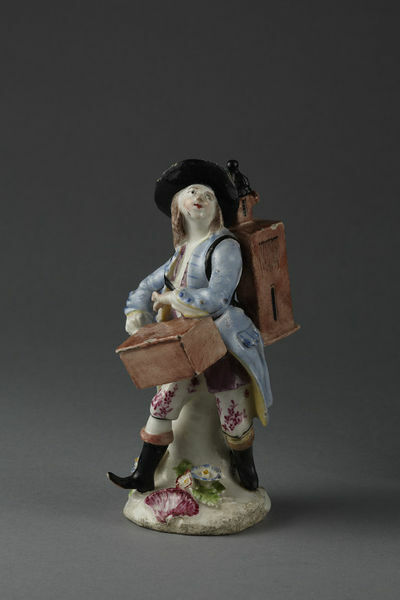 Figure of a man with a magic lantern in soft-paste porcelain painted with enamels. 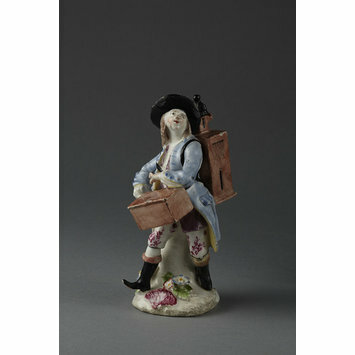 Walking with his right foot forward, he plays a hurdy-gurdy suspended from his shoulder. On his back is the lantern. He wears a blue jacket over a pink waistcoat, crimson flowered breeches and black hat and boots. Circular base with a crimson shell in relief and applied flowers. Figure of a man with a magic lantern in soft-paste porcelain painted with enamels, Bow Porcelain Factory, Bow, ca. 1760.